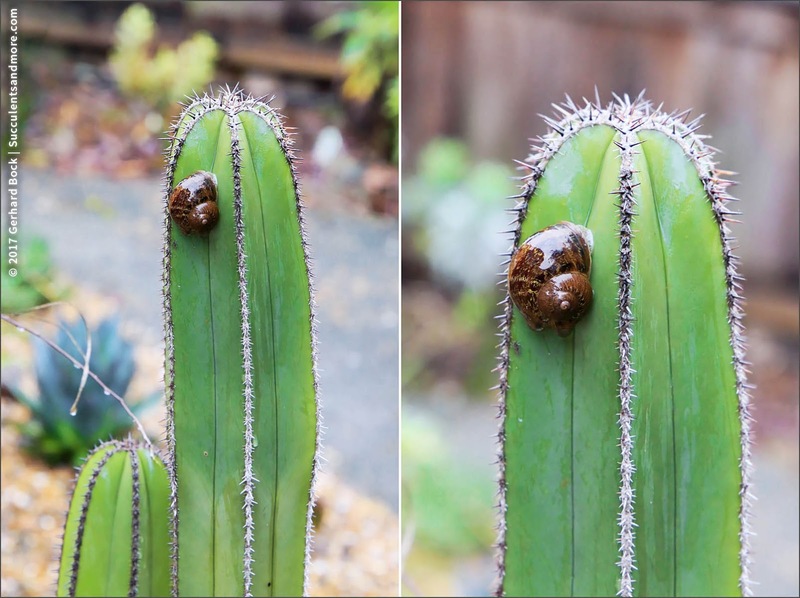 I had to laugh when I saw this snail on our Mexican fencepost cactus (Pachycereus marginatus). Is it just spending the night there or does it actually think it can eat the cactus? The skin of this particular cactus is much too thick, although I've seen snails do damage to new pads on prickly pears (opuntias). By the way, the snail is no more. Did it make a satisfying crunch, or did you just fling it into a neighbor's yard? I did what Brian does: toss it into the street. If it crawls fast enough, it can make it to safety. Reminds me of the snail I spotted on the Euphorbia at Pitzer. Your rainy winter is confusing them! This winter is completely nuts. And another 3-4 inches of rain in the forecast. I built an enclosure for my Agave weberi 'Arizona Star' today to keep it from drowning. Yeah, I wonder where it would have gone. How fast do snails move anyway? I was surprised to find they've been nibbling at my Aeonium arboreum and a Kalanchoe. Your preemptive strike was a good decision! The only good thing the raccoons do for me is to thin the slimy hoard. Oh, they love soft-leaved succulents. The epidermis of this cactus is tougher than an aeonium. I shudder to think how much damage a raccoon might have wrought trying to get to this snail! Bingo! That's exactly what I do: toss them in the street. I've noticed holes in my Mangave 'Macho Mocha' but Sluggo is useless when it rains so much. I thow them into the street rather forcefully, so they don't survive. I found just one on an Agave. Drought has its good points. Weeds and snails nearly vanished. Where did the snails go in the drought? They clearly survived somehow. Mystery upon mystery. I saw a slug climbing the sliding glass door off the dining room today. Ugh. I'm glad to have warm weather (for us) again, but at least that horrible winter weather was keeping the slugs dormant. Ugh, on a sliding glass door? It probably died of exhaustion before it found its way to a food source. Y'all never notice that snails like to climb up plants, especially in wet rainy weather? Even more so for baby snails this time of year, they are all over my Aeoniums, Aloes, Agaves and also up into trees and shrubs. It's a bumper crop year for snails from what I can see. I've never seen a snail on a cactus before. Of course the ribs on this one are very smooth so it had a clear shot to the top. It would be much tougher on, say, an Old Man of the Andes cactus. Fling or stomp, I agree! In this case, the street was the less messy option.